American painter Roy Lichtenstein (1923-1997) pioneered a new epoch in American art, bursting onto a scene dominated by Abstract Expressionism in late 1950s New York and defining a new art vocabulary for a new era. With his groundbreaking use of industrial production techniques and trivial, quotidian imagery such as cartoons, comic strips, and advertising, Lichtenstein joined contemporaries such as Andy Warhol and James Rosenquist to reflect and satirize American mass media and consumer culture. Works such as Look, Mickey! (1961), Drowning Girl (1963), and Whaam! (1963) deployed mass production techniques, particularly Ben-Day dots printing, to create a blow-up effect and pixelated "dot" style, with which Lichtenstein has become synonymous. 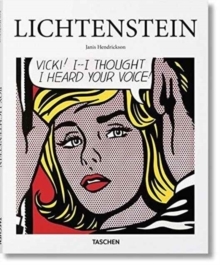 This book provides an essential overview of Lichtenstein's career, tracing his earliest Pop statements through to later "brushstroke" retorts to Abstract Expressionism and reinterpretations of modern masterpieces. We look at his leading position in midcentury modernism, and the ways in which his works both critique and chronicle 20th-century America.